Stone Improvement was hired to clean and seal this outdoor saltillo tile patio. Saltillo tile is a type of terra-cotta tile that originates in Saltillo, Coahuila, Mexico. Saltillo tile is highly porous, and soaks in liquid easily. Unlike most ceramic tile, there is no glaze on the top surface of the tile. The tile will stain and scuff easily if not maintained with a quality sealant. 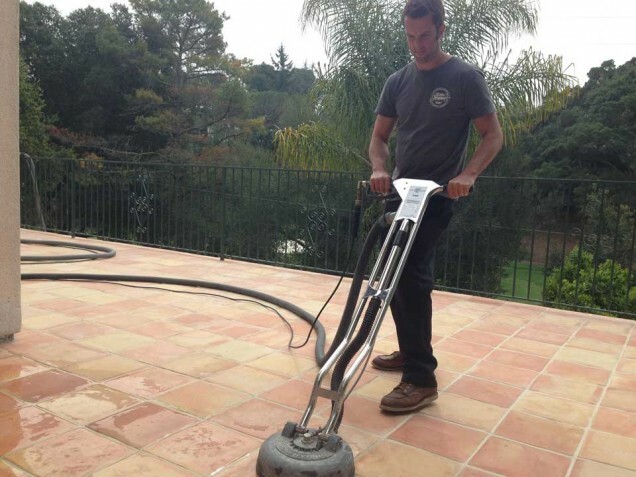 It is important to clean the tile before you seal it so you are not sealing in any dirt. The tile cleaning started with us scrubbing down the tile with a natural stone cleaner and grout brushes. After the tile is scrubbed down we go over it with a hard surface extractor for a deep cleaning. Once the tile is cleaned we let the tile completely dry before sealing it. We used an outdoor solvent based penetrating sealer to help protect the tile from outdoor elements along with oil and water repellency. The sealant does not change the appearance or sheen of the tile.